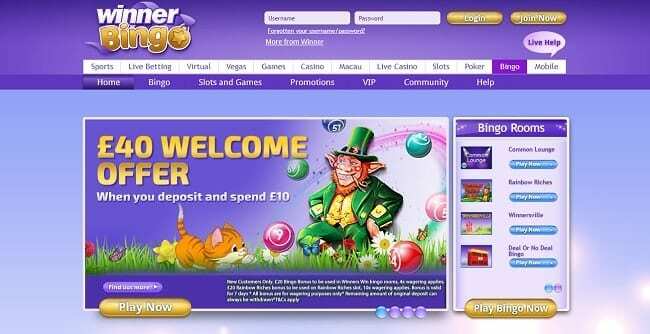 Winner Bingo opened its virtual doors in June 2012. Winner is powered by Playtech, which means that there’s a great game selection, a lot of traffic and big jackpots, including progressive pots. £40 WELCOME OFFER WHEN YOU SPEND £10New Customer Offer. T&Cs Apply. 18+. Please Gamble Responsibly. Winner Bingo is a great site for those looking to enjoy bingo all day long. Sign up now for the best experience! Winner Bingo is part of the Playtech network, which is massive and one of the biggest bingo networks online. The community is huge and, more importantly, active regardless of what time of day or night you choose to play. Bonus codes for established members are also a big plus. Winner doesn’t accept players from the U.S. The most prevalent bingo game at Winner is 90-ball, which is the traditional style enjoyed in the UK. You can also play 75-ball, which is the format popularized in the U.S.; 80-ball, an exciting 90-ball variant; and 50-ball, an online mode played at a brisk pace. This hall also has special variants, such as Deal or No Deal, which is based on the popular television show, and Multi Balls, which lets you play against other players for a share of a community pot. In addition, Winner provides access to a wide selection of side games, including slot machines and scratch cards. If you’re interested in trying Winner Bingo, then you can join in the fun by taking advantage of a juicy welcome offer. This offer is a signup bonus only open to new members. Register a new account, and then validate your login. After that, simply make a £10 deposit, and Winner Bingo will give you a bonus. Winner Bingo is powered by the Virtue Fusion platform, which is developed by Playtech. This bingo platform is very user-friendly. Simply access the website in your web browser of choice. There’s no software to download and configure. Bingo games, side games, chat and other services simply appear in-browser on demand. The website has a great look to it and is easy to navigate. Managing multiple tickets per game is hassle-free and satisfying. The chat system is one of the best in the business and includes options to set a friends list and direct message fellow players. Making deposits and withdrawals is fast and easy. There are aren’t any transaction fees or unnecessary delays, and although minimums and maximums vary from one method to the next, Winner Bingo will let you deposit as little as £1 whenever possible. Winner accepts most major credit cards and debit cards. It also accepts web wallets like PayPal, Paysafecard and Skrill/Moneybookers. Bank and other wire transfers are supported, and you can withdraw from and deposit to different methods. There’s a lot to like about Winner Bingo. Playtech bingo is one of the most attractive bingo networks online for the average player, and Winner really does a lot with it. The site has excellent customer service available 24/7 via live chat. It offers a diverse selection of bingo and other games, and it gives you many opportunities to stretch your bingo bankroll without trying to take advantage of you. You can access Winner Bingo from your smartphone or tablet as well. The Virtue Fusion platform supports HTML5 as well as device-specific apps for iOS, Android and BlackBerry. That means that you have some options on how to connect. Whether you use an app or access the service through the mobile bingo website, you can play in either full- or mini-screen mode. Almost all of the same bingo rooms and side games are available, and you can make deposits and withdrawals from your mobile device. Overall, we would highly recommend Winner Bingo for those who enjoy bingo and want to be winners!